Charlotte Concrete Patios builds high quality concrete patios for commercial and residential clients in Charlotte, NC and the surrounding areas. We are Charlotte North Carolina’s premier concrete contractor! With over fifty years experience, we have developed a solid reputation in Charlotte as a company that provides top quality work, excellent value and customer service that is unmatched in the industry. Charlotte Concrete Patios is a concrete paving company that builds aesthetically pleasing concrete patios , well constructed and made to withstand the wear and tear of everyday use. We employ a team of highly trained and highly skilled concrete paving contractors who use top quality materials from leading brands to construct patios, concrete driveways alongside other concrete surfaces. Our company is fully licensed, bonded and insured for your protection and we guarantee our work. Charlotte Concrete Patios is a premier paving company recognized for our high standards designing and installing concrete patios. We enjoy collaborating with clients to understand their own personal vision for their outdoor living area and afterwards collaborating to bring their ideas to life! We are true artisans with all aspects of concrete patios from designing, add additional elevations to create drama and more usable space and also removal services if your existing patio or sidewalk structures ought to be replaced. We are fortunate at Charlotte Concrete Patios to have a mild climate that allows us to get outside and utilize our patios year round. As you would imagine in a climate such as this, a great deal of our work is focused on helping our clients take advantage of their patios, pool decks and outdoor living areas. Concrete is a man-made paving material that offers many advantages due to its inherent strength and durability alongside its economical price point. When installed properly concrete will require little to no maintenance and look great for years to come. Versatility with Charlotte concrete patios? It may seem unsubstantiated but with recent advancements in concrete there is a wide array of textures, patterns and colors that the modern homeowner needs to select from. 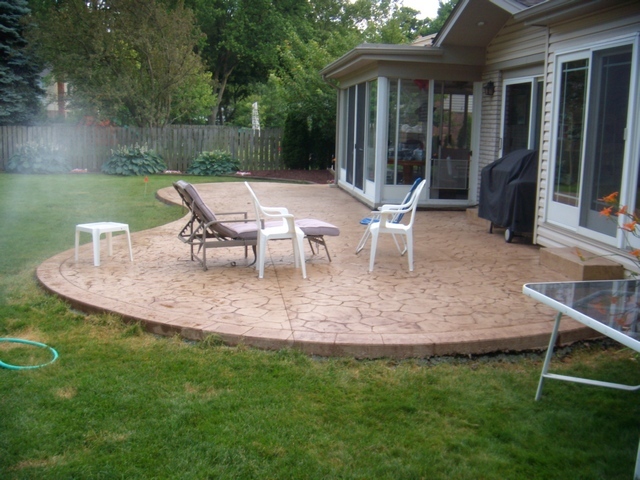 Our concrete craftsmen are well versed in utilizing decorative concrete, stamped concrete and dyed concrete and can walk you through any advantages or disadvantages of each and how they compare with natural brick, pavers and stone. Before beginning your upcoming Charlotte, NC concrete patio project, give Charlotte Concrete Patios a call and let us share our knowledge and expertise with you! Charlotte Concrete Patios has years of experience dealing with concrete and have also stayed at the forefront of innovative concrete materials and techniques. A few of our popular paving material options for concrete driveways, pool decks, parking area and sidewalks beyond standard concrete, includes: decorative concrete, stamped concrete and dyed concrete. We offer stamped concrete, acid stains, concrete countertops, concrete sealing and concrete resurfacing, decorative concrete for new concrete construction or existing concrete renovation. Specialty concrete surfaces offer strength, value and beauty for new or existing concrete.